Summary: MR imaging depicted vertically oriented folia instead of the normal horizontal folial pattern, hypoplastic cerebellar vermis, fusion of the inferior posterior cerebellum, and probable polymicrogyria in the superior cerebellar hemispheres in a child with hypotonia, nystagmus, ataxia, and psychomotor retardation. We propose that this newly discovered cerebellar malformation be added to the list of malformations associated with aplasia or hypoplasia of the cerebellar vermis, such as Dandy-Walker malformation, Joubert syndrome, tectocerebellar dysraphia, and rhombencephalosynapsis. <<006>>Many conditions with cerebellar vermian dysgenesis or agenesis have been described, including Dandy-Walker malformation, Joubert syndrome, rhombencephalosynapsis, tectocerebellar dysraphia, and chromosomal disorders (1, 2). We describe an infant with hypotonia, nystagmus, ataxia, and psychomotor retardation in whom MR imaging revealed an apparently new and distinct cerebellar malformation, characterized by primary vertical folia, fusion of the inferior cerebellum, multifocal cystic lesions in the superior cerebellar hemispheres, and hypoplasia of the cerebellar vermis. A 3326-g boy was born at term by normal vaginal delivery as the first child to healthy, unrelated parents. The family history was unremarkable, with no neurologic disorders. Horizontal pendular nystagmus was recognized soon after birth, and generalized hypotonia, nystagmus, head titubation, and truncal ataxia were identified at about age 3 months. Thereafter, the child showed psychomotor retardation, developing head control at 9 months, sitting unassisted at 20 months, walking alone at 2 years, and uttering his first word at 3 years 6 months. Although his visual acuity could not be evaluated precisely, he could follow his mother at age 8 months and handle a toy or ball at age 10 months. The nystagmus gradually decreased in frequency and intensity, and the head titubation ceased at about 3 years of age. Hypotonia in the lower limbs was replaced by spasticity at about 1 year. At the age of 4 years 6 months, the child was admitted to our institution, at which time physical examination revealed mild horizontal nystagmus, spasticity in the lower limbs, and increased patellar and Achilles tendon reflexes. Head titubation, truncal ataxia, and tremor were not in evidence. Cranial nerves, muscle strength, and pain sensation were normal. Visual acuity was assumed to be 20/250 bilaterally. Fundoscopic examination revealed normal disks and retinal degeneration. Extensive laboratory studies, including CSF examination, serum creatinine kinase, blood gas analysis, chromosome analysis, analysis of serum very-long-chain fatty acids, and gas chromatographic analysis of urinary organic acids were all within normal limits. Electroencephalography, motor nerve conduction velocity, and audio–brain stem response were also normal. Sonographic examination of the abdomen and kidneys showed no abnormalities. Cranial MR imaging, performed on a 1.5-T superconducting magnet, revealed normal supratentorial structures except for left-sided cystic periventricular leukomalacia. However, thin transverse images of the cerebellum showed dysplastic, vertically oriented, folial-like structures in the posterior cerebellar cortex instead of the normally horizontal folia (Fig 1A). In addition, fusion of the cerebellar hemispheres was present in the inferior posterior cerebellum (Fig 1A), continuous thin layers of white matter and gray matter lined the posterior wall of the fourth ventricle (Fig 1B), and the cerebellar vermis was hypoplastic (Fig 1C). The superior cerebellar peduncles were elongated and isolated by the absence of the normally interceding vermis. Small round lesions of CSF intensity were recognized in the superior cerebellar hemispheres on T1- and T2-weighted MR images and on fluid-attenuated inversion-recovery images (Fig 1B), most likely representing small cysts. Surface shaded display images revealed vertically oriented cerebellar folia (Fig 1D) instead of the normal horizontally oriented folia. MR findings in a 4-year-old boy with hypotonia, nystagmus, ataxia, and psychomotor retardation. A, T2-weighted transverse image (3000/100/2 [TR/TE/excitations]) of the inferior cerebellum shows fusion of the cerebellar hemispheres (arrowhead) and dysplastic, vertically oriented, folial-like structures instead of the normally horizontal folia. B, Coronal T2-weighted image (3000/100/2) shows multifocal cystic lesions in the superior cerebellar hemispheres (arrowhead), a continuous thin layer of white matter (arrow), and a left periventricular leukomalacia. C, Sagittal T2-weighted image (3000/100/2) shows a small cerebellar vermis (arrowheads). D, Three-dimensional, fat-saturation, spoiled gradient-echo, surface shaded display image (50/6/1) shows vertically oriented folia. The understanding of a cerebellar malformation is facilitated by knowledge of the process of early fetal cerebellar development. During the fifth week of gestation, thickening occurs bilaterally in the alar plate of the rhombencephalon, forming the rhombic lips, which are the primordia of the cerebellar hemispheres (1, 3). The cerebellar vermis is formed upon fusion of the developing hemispheres when they meet superiorly at the midline during the ninth gestational week; fusion then continues inferiorly as the hemispheres grow (1). Therefore, the vermis cannot be formed without development of the cerebellar hemispheres. Four distinct congenital malformations of the cerebellar vermis have been recognized. Dandy-Walker malformation consists of partial or complete vermian agenesis, cystic dilatation of the fourth ventricle, and an enlarged posterior fossa with upward displacement of the lateral sinus, tentorium, and torcular (1). Joubert syndrome is a clinical diagnosis associated with posterior fossa abnormalities. It consists of vermian hypoplasia or aplasia, resulting in a triangular mid-fourth ventricle and a batwing-shaped fourth ventricle superiorly (1, 4); however, neither a posterior fossa cyst nor hydrocephalus is seen. Patients with Joubert syndrome have a characteristic clinical syndrome consisting of, among other signs and symptoms, episodic hyperpnea, which was not seen in our patient. Tectocerebellar dysraphia consists of vermian hypoplasia or aplasia, an occipital cephalocele, and dorsal traction of the brain stem, such that the hypoplastic cerebellar hemispheres are rotated around the brain stem to lie ventrolaterally to it (5). Finally, rhombencephalosynapsis consists of vermian hypogenesis or agenesis associated with cerebellar hemisphere, dentate, peduncular, or collicular fusion (6, 7); it has not been described with cerebellar folial dysplasia. MR studies of our patient showed no cystic dilatation of the fourth ventricle, tentorial abnormality, hydrocephalus, occipital encephalocele, brain stem traction, or cerebellar rotation; therefore, Dandy-Walker malformation and tectocerebellar dysraphia could be ruled out. The hypoplastic vermis, the fused inferior posterior cerebellum, and the thin layer of fused cerebellar white and gray matter posterior to the fourth ventricle looked a little like rhombencephalosynapsis. However, the gray matter lining the posterior fourth ventricle, which could have represented dysplastic cerebellar nuclei or a heterotopia, did not have the horseshoe appearance of the fused cerebellar nuclei seen in rhombencephalosynapsis (1, 6). Moreover, other distinctive features of rhombencephalosynapsis, such as transversely oriented folia in the inferior cerebellum, were not recognized in this patient, and the remainder of the brain exhibited none of the manifestations of rhombencephalosynapsis, such as the absence of a septum pellucidum, hydrocephalus, fusion of the inferior colliculi, and hypoplasia of the anterior commissure (1, 6). In addition, the vertical folial pattern and multifocal small cystic lesions in the superior cerebellar hemispheres have not previously been reported in rhombencephalosynapsis. Therefore, we believe the cerebellar malformation was other than rhombencephalosynapsis. 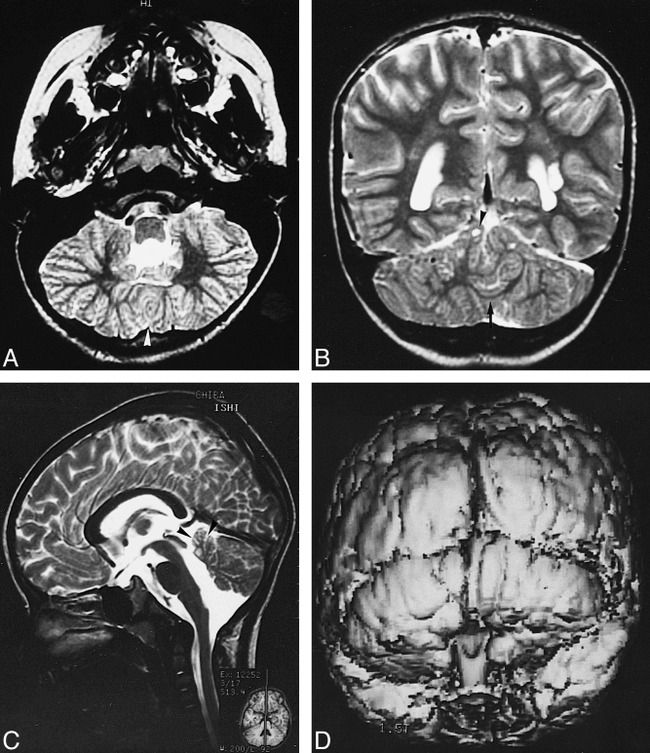 Concerning the cystic lesions in the superior cerebellar hemispheres, similar small cysts associated with polymicrogyria have been observed in the cerebellar hemispheres of patients with Fukuyama-type congenital muscular dystrophy pathologically (8). We suspect that the cysts seen in our patient are similar, although we have no pathologic proof. The glial and neuronal cells that compose the cerebellum migrate to their final locations in the cerebellar hemispheres through two general pathways (1, 3). The neurons that will form the deep cerebellar nuclei and the Purkinje layer of the cerebellar cortex migrate radially outward from the germinal matrix in the wall of the fourth ventricle. The neurons that will form the granular layer of the cerebellar cortex, in contrast, begin to migrate tangentially from the germinal zone (in the lateral portion of the rhombic lips) over the cerebellar surface, forming the transitory external granular layer. The premigratory granule cells in the external granular layer are only seen when Purkinje cells are present beneath the external granular layer in rats (9). A local increase in premigratory granule cells and an indentation of the Purkinje cell layer are early signs of foliation and occur prior to the formation of a fissure (9). Actually, the rate of proliferation of external granular layer cells is higher along fissures than at the crests of lobules in the mouse cerebellum (10). Recently, a variation in the cerebellar foliation pattern of mice was reported to be influenced by some genetic elements; that is, at least three loci, including Cfp-1 on distal chromosome 4, are involved in the variation of vermian pattern formation (11). It is not fully understood why the cerebellar folia run horizontally; however, the external granular layer and Purkinje cell layer may be involved in the mechanism underlying foliation. Another possibility is that the meningeal cells over the cerebellum are dysplastic for some reason. It is known that the overlying meningeal cells influence cerebellar foliation and lamination (12). The pathophysiology leading to this malformation remains to be elucidated. We speculate either a gene expressed in cerebellar development is mutated and that this mutation disrupts the migration pathways or the cortical organization of the Purkinje and granule cells or both. Such a disruption might lead to polymicrogyria in the superior cerebellar hemispheres, and, conceivably, to vertical foliation. Pre- or perinatal injury is considered a less likely cause of this malformation, because it seems unlikely that the entire cerebellum would be diffusely affected by injury with no effect on the remainder of the brain except for periventricular leukomalacia. The clinical manifestations seen in this patient (generalized hypotonia, head titubation, truncal ataxia, nystagmus, and retinal degeneration) were similar to those seen in patients with Joubert syndrome and Dandy-Walker malformation. Therefore, we contend that this cerebellar malformation corresponds closely, both clinically and neuroradiologically, to other cerebellar malformations associated with aplasia or hypoplasia of the cerebellar vermis. Our patient had a cerebellar malformation characterized by vertically oriented folia, fusion of the inferior cerebellum, multifocal cystic lesions in the superior cerebellar hemispheres, and hypoplasia of the cerebellar vermis. We believe this to be a new malformation, which should be added to the list of cerebellar malformations that accompany aplasia or hypoplasia of the vermis. We thank Fuminori Morita and Yoshitada Nakano for their excellent technical support. 1 Address reprint requests to Jun-ichi Takanashi, MD, Department of Pediatrics, Faculty of Medicine, Chiba University, 1-8-1 Inohana, Chuo-ku, Chiba-shi, Chiba 260-8677, Japan. Accepted after revision March 5, 1999.